UNICEF Gender Action Plan (GAP) 2018–2021, includes gender mainstreaming across all programming areas, including education as a priority. To make sure that gender equality is effectively mainstreamed into education programming it is necessary to develop new approaches to support our staff globally, at the country and regional levels, though in-country program reviews and other learning tools. Strengthening the capacity of UNICEF’s education staff will have a positive effect on UNICEF’s goal of strengthening education systems. The UNICEF Strategic Plan and Gender Action Plan (GAP), 2018–2021 include gender equality as an integrated priority across all five goal areas. The GAP includes five targeted priorities which aim to empower adolescent girls. One of these priorities is secondary education for girls, which along with gender mainstreaming aims to improve gender equality for all girls and boys across sectors, including in education systems. Keeping girls in school can contribute to a number of high level outcomes, including reduction in early marriage and pregnancy. Gender equality in education, including secondary education for girls, is one of the most transformative development strategies in which to invest. Gender equality in education facilitates that both boys and girls learn free of bias and discrimination and progress towards accessing and completing secondary education. Completion of secondary education brings the most significant positive benefits to girls and societies – from dramatically increased lifetime earnings and national growth rates, to reductions in child marriage, stunting, and child and maternal mortality. UNICEF is committed to promoting equality for girls and boys from birth through adolescence by addressing the gender-specific discrimination and disadvantages that generally affect girls, but also boys, and that impact key life outcomes such as access to education and learning. Advancing gender equality in and through education -including secondary education for marginalized girls and boys, requires a sound understanding of gender equality in education, so that effective programs on eliminating gender bias in the classroom, as well as in society more broadly, can be developed and implemented by UNICEF Staff. UNICEF adopts a cross-sectoral approach to programming for adolescents, including a major initiative to End Child Marriage. The Education Section based in New York supports UNICEF's commitment to advancing girls' education and gender equality in education in its policy leadership and support to countries for excellence in programming. This includes the application of a gender lens across all education programming and through gender focused investments where appropriate. It also includes hosting the UNGEI Secretariat to support an external facing partnership. The Consultant on Gender Equality in Education will support this dual approach to girls' education and gender equality. UNICEF HQ, Education section, has developed an approach to strengthening gender equality in education programming. Five programmatic shifts have been identified with the potential to accelerate progress towards gender equality in education. The approach goes beyond girls only to a principled gender analysis of the education barriers faced by both girls and boys. This new approach needs to be translated into learning tools that are user friendly and support capacity building at country, regional, and global level. For UNICEF to effect change in terms of strengthening education systems to be gender-equitable, all UNICEF education staff should have access to programming tools that are easy to use and enable them to consider girls’ and boys’ specific needs and opportunities, and the gender responsiveness of education laws, policies and systems. Therefore, capacity building efforts in gender equality in education led by UNICEF Headquarters will focus on providing technical support to country offices in the form of accessible tools and information that strengthen the capacity of the education team in terms of gender analysis applied to their education program. 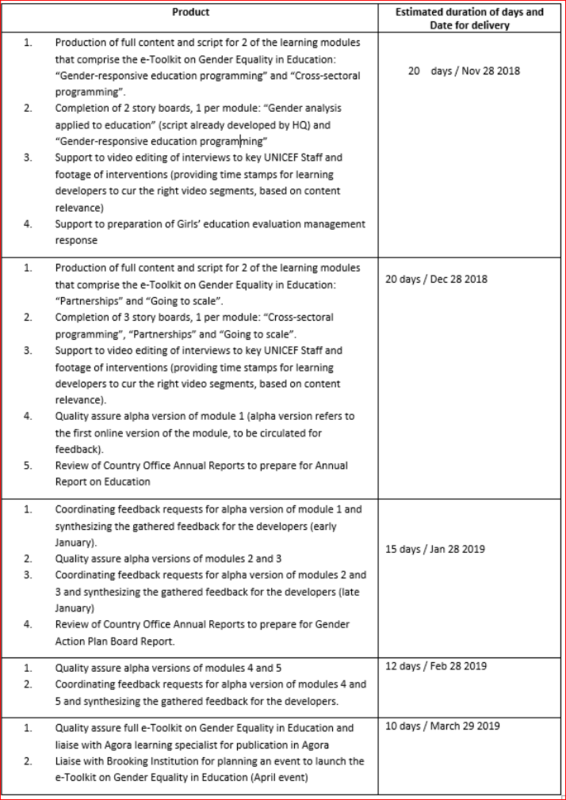 Under the guidance and direct supervision of the Education Specialist (Gender Equality in Education), the consultant will contribute to capacity building efforts through direct content support to online learning initiatives (e-Toolkit on Gender Equality in Education) accessible to all UNICEF staff and the general public. The consultant will liaise with technical staff in UNICEF (e.g. education, gender, child protection, health, adolescent development, etc.) and the learning and software developers, to produce content rich templates, editing documents, supporting video editing, and producing story boards in a creative and technically accurate manner. In addition, the consultant will support country programming when needed and monitoring and results reporting, with a focus on the GAP Targeted Priority Countries. This includes several countries that are also part of the Global End Child Marriage program. The Consultant will also provide strategic and technical support to the UNGEI Secretariat. Completion of 5 story boards, 1 per module to be used to inform the learning developers. Providing expert feedback to program documents and initiatives on gender equality in education led by HQ as needed. An advance (Master's) academic degree in education with relevant expertise in gender equality in education in international contexts. Girls’ education and international engagement strategies, including the application of the equity lens and human rights perspectives to programming. Good understanding of gender and inequity issues in relation to education and development and the application of gender / equity analysis to policy and planning in education. Experience at international level with designing, implementing, and/or evaluating girls’ education and gender equality in education programmes. Experience with writing and synthesizing complex research and programme initiatives for a range of audiences. Demonstrated ability to express ideas and concepts clearly and concisely in written and oral form; excellent diplomatic and negotiation skills in working with colleagues across sectors. Highly organized with ability to work across functional areas and with multiple priorities; self-starter with the ability to deliver results. Understanding of UN systems and country programmes a plus. Good command of English both written and oral, command of French and/or Spanish is an asset.